Dirk Staschke’s first museum exhibition: "creamy and syrupy stacks of sweets, yet, decay and collapse is looming right around the corner"
Inspired by the bountiful Vanitas still-life paintings of 16th-century Northern Europe and the excessive ornamentation of the Baroque period, Dirk Staschke seduces the viewer with his voluptuous organic forms while exploring themes of excess and its effects. 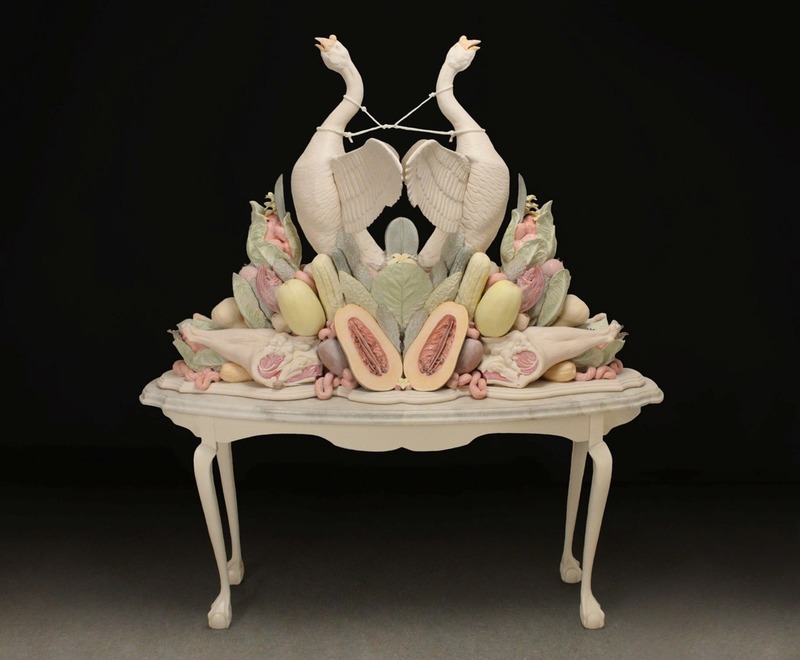 A master ceramicist whose work has been shown internationally, Staschke is best know for his banquet style displays of flora, fauna and food. In Falling Feels a Lot Like Flying, an exhibition specifically created for Bellevue Arts Museum, the artist takes his work to a new scale. Comprised of more than ten large pieces, the exhibition captures the beauty and opulence of a moment in time -- creamy and syrupy stacks of sweets -- yet, decay and collapse is looming right around the corner.